In this world of pressing EMF issues let's take a moment to lighten up with engineer jokes and other EMF related humor, if only to laugh at the ridiculousness of it all. Who says Engineers and EMF Consultants don’t have a sense of humor? We asked our site visitors to send their favorite EMF, electrosmog, cellphone and engineer jokes, and here are some of the best ones we received. (Know who to credit these jokes or cartoons to? Let us know). The Humorous Side of EMF? CBS Late Late Show host Craig Ferguson recently had this tongue in cheek observation about the newest EMF concern. "Everyone is talking about these Google glasses (when I say everybody, I mean me). Google glasses are the next stage in the evolution of eye wear. Wear them and record everything you see. It's like you have a memory! People are already worried about [EMF] radiation from cellphones. So why not make a device that you can put right next to your eyes all day!?" A Certified EMF Expert Consultant died and stopped at the Pearly Gates. St. Peter looked over his chart and had bad news. "According to my records, you are not scheduled to be admitted to heaven. You go to the other place." The consultant was very disappointed, but followed the path down, down, down, past the creaky iron gates to Lucifer's fiery abyss. A couple weeks later, St. Peter found the missing log entry. The consultant was supposed to be in heaven after all! So he called Lucifer. "You know that EMF Consultant we sent you, that was a mistake. He's ours. You need to send him back." But by this time, Lucifer was getting used to having the EMF Consultant on staff. "Send him back? Are you kidding? You've got plenty of consultants up there. 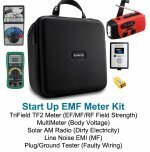 This is the first EMF Consultant I ever got, and Certified to boot! And since he got here, things have been improving rapidly. Our power lines are running without any electrical discharge. Our hazardous electromagnetic fields are a thing of the past thanks to shielding. He even suggested that we could shield the giant generators that power the air-conditioning, So now, they run so much more safely that we can leave them on longer and the remaining heat is run into hot tubs everywhere! We have cool water piped all throughout Hades! It's not not as hell anymore. It's like heav--, I mean, it's great! Not only that, even the clocks are all battery powered now and never need resetting after an outage, which drove me nuts! I'm going to keep him and there's nothing you can do about it!" St. Peter was insistent, "If you don't sent him back, I'll sue. You leave me no other choice ." Lucifer laughed. "Sue? Don't be ridiculous. Where are YOU going to find a lawyer?" The optimist says the glass is half full and the pessimist says the glass is half empty. The engineer looks at them both and says "the glass is twice as big as it needs to be". A group of NASA engineers were brainstorming how they might overcome the thermal challenges involved in sending a manned probe to the sun. An electrical engineer overheard their discussion and suggested "why don't you just go at night?". A priest, a tax collector and and engineer get caught up in a revolution and all are sentenced to die by guillotine. The priest is the first to clamped into the dilapidated old slicer. The rope was pulled but the blade refused to fall. All proclaimed it a miracle and decided it was divine intervention and the priest was released. The tax collector was next and all knew that this hated man would surely die. The rope was pulled the blade dropped and stopped halfway. All agreed that there must be something redeeming about this man that would bring about such mercy and they released him. The engineer was then led to the place of execution and they prepare to lock him in. He glances up at the blade and says "Hey, I see your problem!" An Electrical Engineer walking through the utilities substation was told to follow electrical discharge safety measures and stay outside the ESD-safe area. He replies "Don't worry, I've been told I have no potential". An Electrical Engineer was on a Navy battleship during politically touchy times and all ship-to-shore communications were limited to strictly official business. The EE's wife was about to give birth to their first child, so he made a deal with the radio operators to have the announcement sent to him in a coded message. Eventually the big event happened and he received an official message, "The radio parts have arrived in good order." "Acknowledged. Please inform if receiver or transmitter." 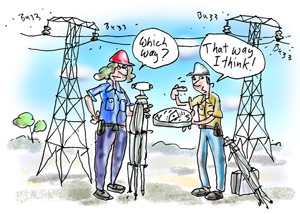 Got a good engineer joke, or a bit of EMF humor to share? 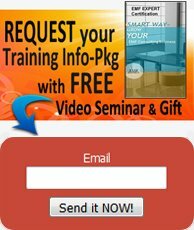 Email it to us for inclusion here. Want to read some more good EMF Consultant stories and testimonials? You'll find those stories here.